UV teeth whitening is one of the easiest, most cost effective procedures you can do to improve your appearance. Best of all - you can do it while you tan. Obtain whitening results that only Dentists could achieve, and save time and money, by using Twilight Teeth during your tanning session with No Sensitivity! It’s complete with a comfortable mouthpiece and a simple application process with an enjoyable mint flavor. Before your tanning session place Twilight Teeth mouth guard in position making sure that teeth are visible through the front of the mouthpiece. Apply one layer of Twilight Teeth U.V. Whitener on your teeth. No need to re-apply. Do not rinse. Whiten your teeth with Twilight Teeth during your next tan. 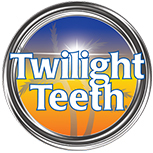 Twilight Teeth kit includes about 10 applications. It is activated quickly during your tanning session and whitens effortlessly throughout the day. For best results, teeth should be clean before treatment. You will notice Dramatic Results after Your 1st Use! And Extremely Dramatic Results after Your 3rd Use! Call to book an appointment or just come in during our regular hours. Get 15% OFF your First Twilight Teeth Whitening System. Results After First Use!